I used to love sushi even before my first visit to Japan, and was looking forward to trying it in its homeland. I can’t say I was disappointed. After having eaten sushi in Japan, the sushi on offer back in Norway often seems bland and boring. 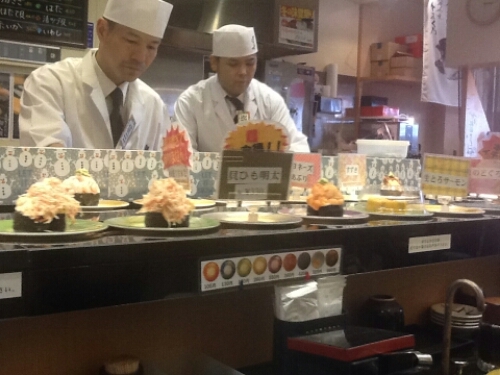 Sushi in Japan simply is better. 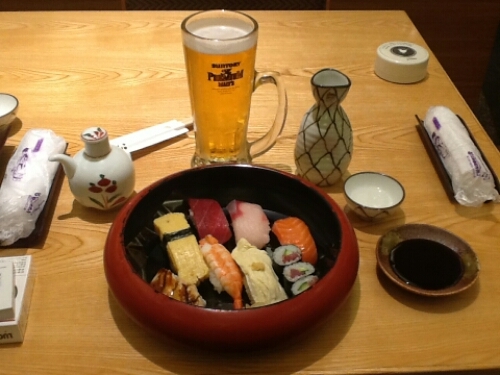 Sushi has a long history in Japan, and sushi has also changed considerably. The sushi as we know it, with fresh, raw fish, served either as nigiri (raw fish on top of a ball of rice) or maki (fish and rice wrapped and rolled in nori paper), didn’t really exist until recently. One can only think of the problem with keeping raw fish cold and fresh in a world without refridgerators. Sushi started as what is today called narezushi. It wasn’t a Japanese invention, but rather a Southeast Asian one. From there it spread to south China and further to Japan. Salted fish was stored in fermented rice for long periods of time. The fermentation process kept the fish from spoiling, and only the fish was eaten. It was a good way of preserving fish and keeping it safe to eat. It can still be found served today, but it is not so common. I myself have never tried it. It is said that the taste is like the taste of well-matured cheese, Rocheford cheese it is often compared to. In the 16th century a dish known as namanare appeared. The fish was fermented for a shorter period of time, marinated in rice vinegar, and served wrapped in rice. The distinct smell of narezushi remained. As refridgeration methods got better, sushi was served fresher and fresher until we arrive at the dish we know today. 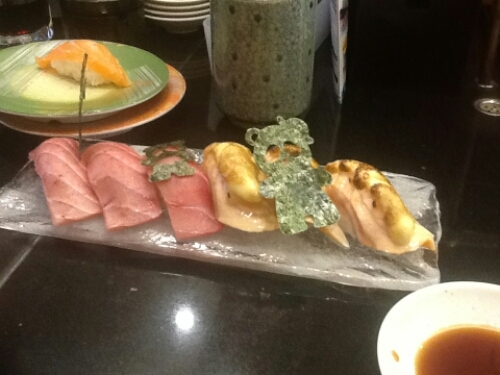 Nigiri sushi was first introduced in the early 19th century out of mobile food stalls in Edo (Tokyo). Making sushi with fresh fish meant it could be prepared quickly and it was an easy and convenient meal to eat on the go. 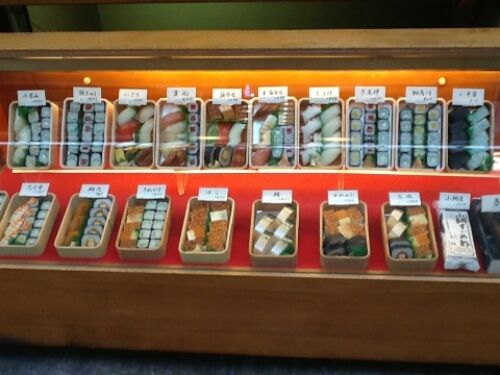 Sushi quickly became popular as a fast food. The great Kanto earthquake in 1923 displaced Edo-chefs all over Japan, making Nigiri a popular dish all across the country. 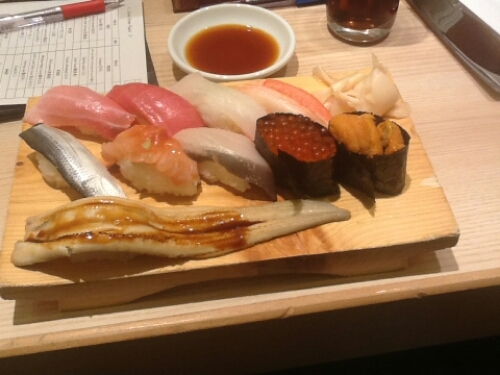 Today there are thousands of sushi restaurants in Japan. The most common types is the sushi bar, where you sit by the bar surrounding the kitchen, only a meter or so from the chef, or the conveyor-belt restaurant, where the food is placed on a conveyor belt in front of you and you can choose what you like as it passes. 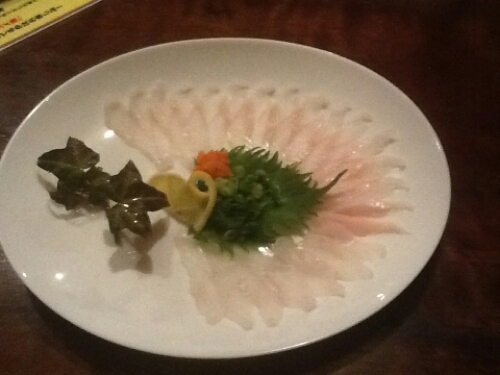 I got to know a sushi chef who lived in Ueno, and loved to visit his restaurant. Half the food he gave me I wasn’t charged for, and every time I left I would get a coupon for 15% off at my next visit. As they also had free servings of green tea, a visit there did not cost much. Thanks to my friend the chef I was quickly introduced to a wide variety of sushi. There was so much more to choose from than in Norway, so many more types of fish being used. If visiting a sushi bar, I recommend ordering omakase. This means you let the sushi chef decide your meal for you, picking from the freshest catch of the day, some of it maybe not even on the menu. The fish will also be served in the order the chef thinks is best, and served one by one so you can eat it as fresh as possible. And don’t be afraid to try new things. There will be a lot of fish you might not have seen before, and the staff’s knowledge of English might not be good enough to name the fish in English. I have eaten so much fish in Japan that I still not know what was, but most of it was delicious, and none of it bad. Keep following my blog for more posts about Japanese food. I will make sure to post from visits to sushi restaurants. If you are interested in sushi, I recommend this book by Trevor Corson.